While the term advanced persistent threat, or APT, joined the common vocabulary of the information security profession in mid-January, this term is still often misunderstood. 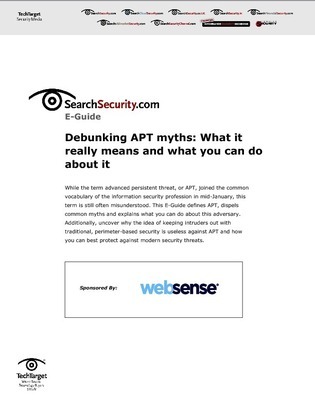 This E-Guide defines APT, dispels common myths and explains what you can do about this adversary. Additionally, uncover why the idea of keeping intruders out with traditional, perimeter-based security is useless against APT and how you can best protect against modern security threats.